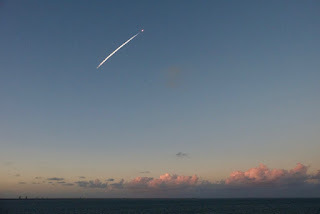 If Silversea wanted to finish this cruise on a high, they couldn't have commissioned a better fireworks show than to give us the chance to watch a rocket launch at such close hand from Kennedy Space Center. 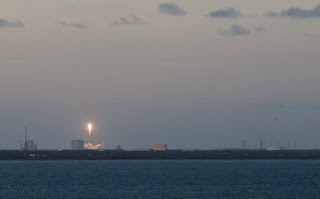 Because, SpaceX (the Space Exploration company put together by Tesla entrepreneur Elon Musk) was scheduled to launch a communications satellite from Kennedy at 6.53pm, and we were leaving Port Canaveral at 6.00pm. So, the Captain kindly allowed us to wait offshore for the launch time – although, we fully expected the launch to be delayed or even cancelled, as is often the case. I was getting the live updates online on the progress of the launch as all the checks were done, and all indications were that it was going to plan. As T-minus 90, went to T-minus 30, to T-minus 5, our excitement levels were going stratospheric. Were we really going to witness a rocket launch? I've always dreamt of it. Tracy and I were almost jumping up and down with excitement at the front of the ship as the seconds counted down, then we saw the ignition (we had been looking at the wrong launch pad, but we quickly worked out which was the right one). The flame was incredibly bright, but strangely enough there was no sound – the wind was blowing in the other direction. We must have been about 6 miles away, but from this distance the rocket seemed to leave the launch pad at a slower rate than I thought it would, although it quickly soared away into the atmosphere. Only after a minute or so, did we hear a distant rumble that lasted for just a few seconds. The trail of vapour as it disengaged from its fuel tanks left a lingering trace in the sky as the fierce flame turned into a distant dot of light, before disappearing altogether. It was amazing to think that this fleeting yet exhilarating glimpse of the space programme would have been the culmination of years of planning and billions of dollars of expenditure. It was a privilege to watch and an incredible send off for what's been a really enjoyable month on the Silver Muse. Whoever told you that it's not rocket science was lying after all. PS. After a few days in Florida, we'll be back in the UK for a couple of weeks, before heading off to Hong Kong to join the Silver Shadow for a month-long journey down to Sydney. See you on November 3rd!